A quick flashback of what went down two weeks ago – first, the official launch of the ZenFone Max Pro in partnership with Lazada Philippines, then the introduction of the MAX A-TEAM, and most recently, the ZenFone Max Pro’s first-ever appearance in the country at the FRAGFEST 2018. In this short span of time, the ZenFone Max Pro became the talk of the town and landed on everyone’s must-have list – after all, it is a beast in its own right. 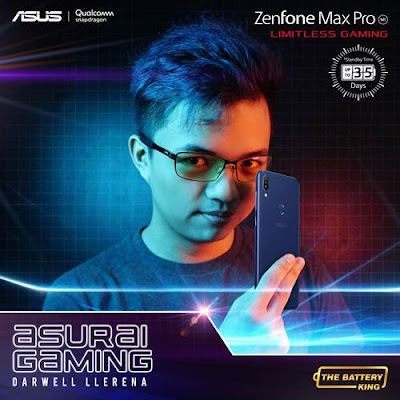 Always present in the local and international gaming scenes, professional shoutcaster and streamer Darwell Llerena, also known as “Asurai”, was one of the few lucky Filipinos who were able to get their hands on the ZenFone Max Pro before its nationwide availability on Monday, June 25. Asurai’s rise and passion in gaming was no overnight feat. In fact, he started playing games at a young age, starting with a Super Nintendo and Sega Genesis. From that moment on he hasn’t stopped playing. Despite this, his love for games and career in shoutcasting was never a hindrance to his studies. While in college, he was lucky enough to have time in between classes to be able to do shoutcasting, and this led him to land casting gigs that early. Talk about good timing, right? HI ASURAI! WE’RE A BIT CURIOUS, CAN YOU SHARE WHY YOU CHOSE “ASURAI” AS YOUR IGN? THAT’S WITTY! <LAUGHS> NOW, CAN YOU TELL US HOW YOU STARTED YOUR SHOUTCASTING CAREER? DID YOU EVER SEE YOURSELF ON THIS PATH EVEN IN YOUR YOUNGER YEARS? Hmm, actually not at all. My family is very traditional. I have uncle and aunts who are lawyers and doctors while I'm supposed to be a pharmacist. OH, THAT MAKES YOU A GAME CHANGER IN YOUR FAMILY! WHERE DO YOU SEE YOURSELF IF YOU’RE NOT A CASTER-STREAMER? I’d probably be in Tech Reviews since I am also fascinated with everything that revolves around that ecosystem, especially gaming. SO YOU ARE A LOVER OF TECH TOO! WHAT DO YOU THINK OF THE RISING TREND IN MOBILE GAMING? Before, I didn't think of mobile gaming much, but in the recent years it has changed because the evolution of great games isn't only in PCs or consoles, it also reached mobile regardless of what other people may say. COOL! SO YOU ARE ONE OF THE LUCKY ONES WHO WERE ABLE TO USE THE ZENFONE MAX PRO FOR QUITE SOME TIME NOW, HOW’S YOUR EXPERIENCE SO FAR? It was amazing! I think the fact that it's a great all-rounder phone makes it perfect for me, being able to play games, record media, and watch online content without having to worry about running out of battery. Thanks to its huge battery capacity - it is such a big deal for me! It was a great companion during my COMPUTEX trip! NICE! GOOD TO HEAR THAT YOU ARE ENJOYING YOUR PHONE! WHAT’S YOUR FAVORITE FEATURE OF THE ZENFONE MAX PRO? The feature that I highly appreciate right now on the Max Pro is the 6-inch display which allows me to absorb more of the game that I am playing. I like it when the navigation bar automatically disappears when in-game! I can now play AOV or Mobile Legends without the worry that I might just accidentally click the home button. WE LIKE THAT TOO! YOU MENTIONED THAT YOU PLAY GAMES, RECORD MEDIA AND WATCH ONLINE CONTENT ON YOUR PHONE; DO YOU USE IT AS YOUR DAILY DRIVER NOW? Yes! I use it as my daily driver now. I like the combination of the big battery and big display. SO HOW LONG DOES THE PHONE’S BATTERY LAST? Since I use it extensively throughout the day, including some moderate gaming on the side, it lasts probably around 8 to 10 hours. It’s not bad because I won’t need to find a wall outlet or scramble for a powerbank in the middle of the day. WE’RE HAPPY FOR YOU! HOW DO YOU FEEL NOW THAT YOU ARE PART OF THE MAX A-TEAM? It's always nice to be part of a group that revolves around gaming! And that’s what makes me happy! WHAT MADE ASURAI EXCITED FOR THE ZENFONE MAX PRO? The newest ZenFone Max Pro now comes in two variants! You can now choose between 3GB RAM + 32GB of storagethat sports a 13MP + 5MP rear camera or 4GB RAM + 64GB of storage with 16MP + 5MP rear camera. Both come with a powerful combination of a big battery capacity of 5000 mAh, a powerful yet efficient Snapdragon 636 - the key essentials for one of the best gameplay experiences without hitting 0% battery life, and an 8MP front camera for photos and selfies at any time and place. Are you ready to go limitless? Click here to order 3GB and Click here to pre-order 4GB! For more information about the newest ZenFone Max Pro, tune in to ASUS Philippines Facebook Page and ZenTalk Philippines Forum.